adding to the interactive experience of our live kitten cam. 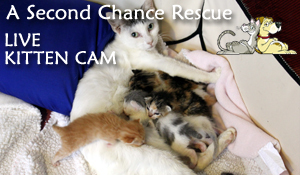 Team Cat uses their USTREAM usernames on the blog, so follow along with KittenRescues, KittyKatFL, Love_My_Cats, SmittenKittens18 and others. Donate to A Second Chance Puppies and Kittens Rescue to help in our mission to save and find homes for the most vulnerable animals who are dumped at shelters by the thousands every day.